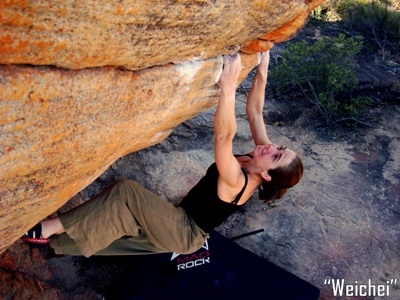 Rachelle de Charmoy had a brilliant month in Rocklands, becoming the first South African lady to boulder 7C+ with her ascent of "Weichei" at the Plateau boulders. Rachelle also managed an ascent of the ultra classic "Kingdom in the Sky" 7C, "Maniac" 7B, and the Fortress's "Much Ado About Nothing" 7B. On the same trip, Rachelle's brother Benjamin also sent "The Amphitheatre" 8A+ at The Otherside.